Jet Airways, India’s premier international airline is back with the best deals, for guests planning their travel from Singapore. Travel more, Save more! The discount is available for purchase till April 30, 2018, allowing guests to commence their journeys from July 1, 2018 – October 10, 2018. 15% discount is applicable on base fare in Economy and 10% discount is applicable on base fare in Première for travel from Singapore to destinations across our network. Valid for travel on Jet Airways direct flights on its domestic and international networks from Singapore. However, guests will have the flexibility to alter their travel plans at an additional charge. 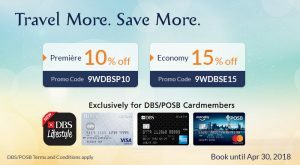 This offer is available only on jetairways.com and mobile app when used with select DBS/POSB cards. For further information, guests may visit www.jetairways.com or the airline’s Mobile App.